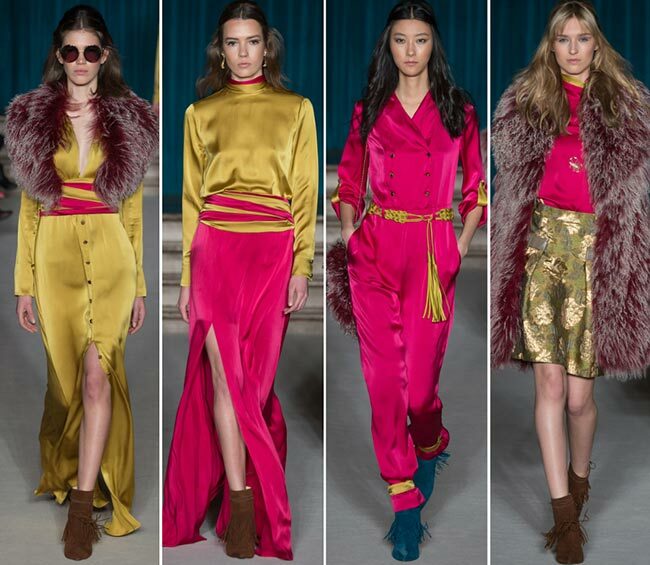 Matthew Williamson, the 43-year-old fashion designer, brought opulence to the catwalk today, with a journey through time it seemed as we walked into a bohemian past. It was a very rich palette to behold, the kaleidoscope of colors jumping out and really showing off the beauty that can be without inserting darkness into the already dreary seasons of the year. 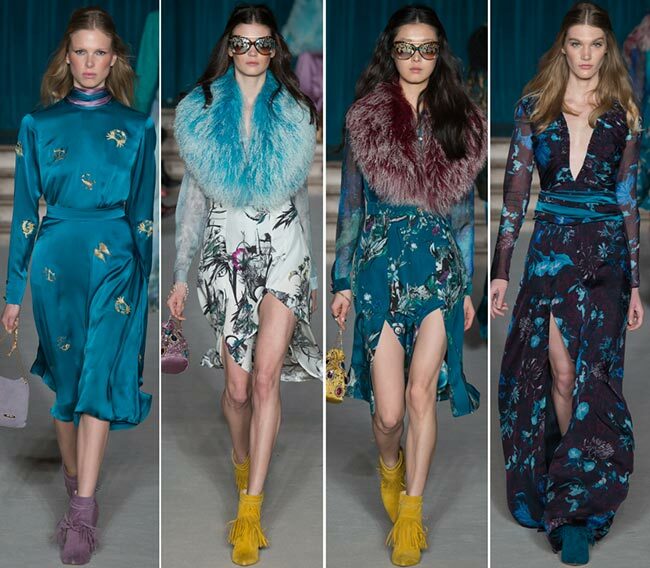 He used the signs of the zodiac as his muse for the Matthew Williamson fall/winter 2015-2016 collection and the mystic symbols turned into great art for the creation of each piece from the 30 that made up the whole of the line-up. It all	began with purples and moved into reds, before the pinkish tints took on the gold and then the blue of the seas and the skies before moving into indigos and then into a whiter, clearer background from which the floral designs bloomed. It seemed as if the colors were taken from jewels themselves, with the shimmering shades of different birthstones finding their place on the runway with ease. We had garnets and amethyst, jade and sapphire, all of which served to brighten up the collection from the inside. And it worked perfectly. 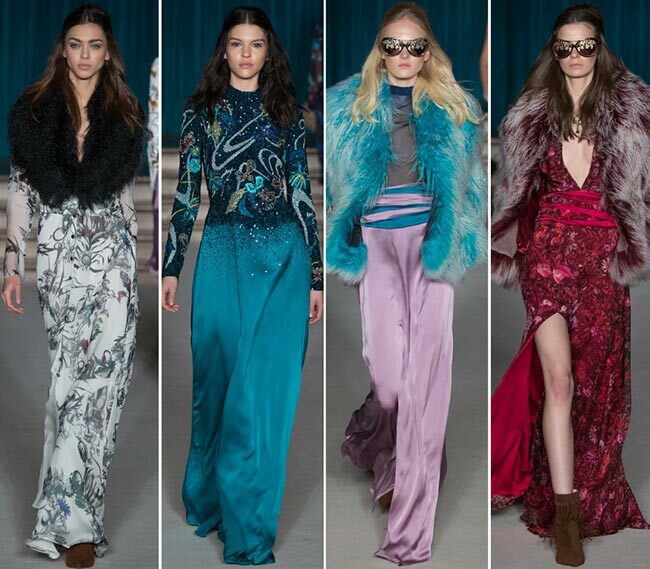 The Matthew Williamson fall/winter 2015-2016 collection is without a doubt one of the most vibrant of the fashion lines seen both on the New York Fashion Week runway and now on the London Fashion Week’s shows. 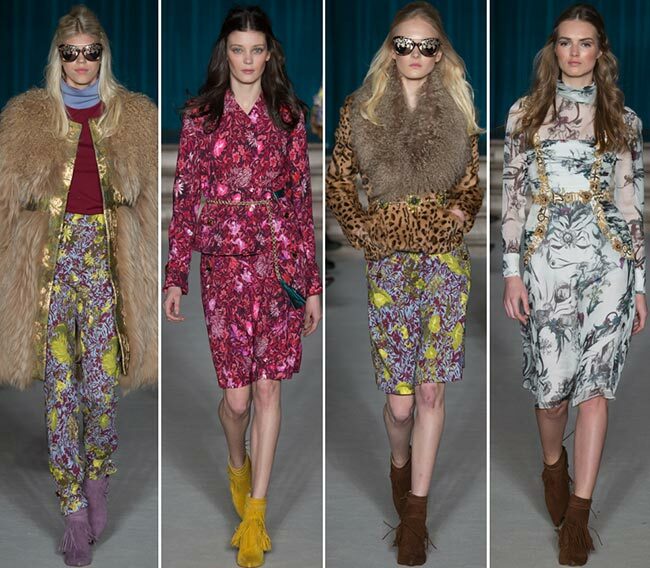 There were shaggy Mongolian and leopard print furs, which were layered in with the floral printed chiffon shirts. They were worn with the tight cigarette coup pants with their intricate designs that may not be the trending fashion but somehow manage to appear often enough, as well as the billowing floor length gowns that really had us catching our breaths: they were so exquisite. As is the custom on all the runways these days, there were jumpsuits as well with brocade twisted as belts, and coats thrown over the shoulders. There is an air of elegance, of nonchalance and a richness to the designs that was not expected. 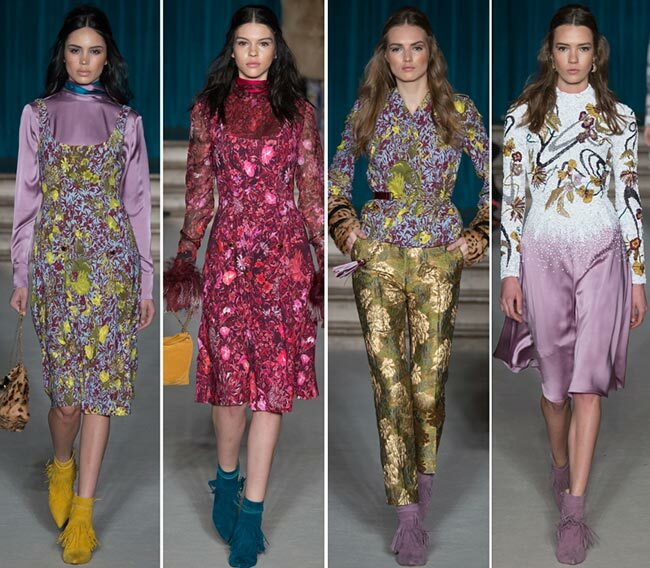 The floral prints have been in fashion since the beginning of the year’s shows, though the punctuation of cardamom embroidered swirls adds for a lovely effect on the Matthew Williamson pieces. Other trends also make it onto this particular runway, including the obi style silk belt and the plunging deep V-necks; you cannot have the plunges without the slits either, so we certainly had nice flashes of leg up to the thighs throughout the collection. There were dusty pinks and Indian style fuchsias, gold bullion thread work embroidery and lovely midsummer folkloric prints. It was all quite a lovely combination that had us smiling throughout the whole of the show. Add fringed, Bionda Castana ankle boots to the mix and it was clear that the designer was adamant about showing off the fact that despite the chillier weather of the later seasons, the fun and color that defines summer need to reach an end. On the contrary, it should be celebrated throughout the year, up until we welcome the year 2016.